Below you’ll find some of the answers to questions we’re asked every day. Feel free to submit your questions using the form at the bottom of this page. Q. What should I do if my child has a sports injury? A. When a muscle or bone injury occurs it is important to control pain, muscle spasm, inflammation and hemorrhage (bleeding). An easy way to remember how to treat a sports injury is by following the acronym PRICE. Protection: Stabilize the area. This can be done with crutches, sling, or a splint. The area should be stabilized the first 2-3 days to promote healing. Rest: Excessive movement or movement too early will increase pain and swelling which can prolong recovery. The athlete should take time off from their sport and limit other activity while the injured area is still painful. Ice: Ice works by decreasing blood flow and minimizing pain and muscle spasm which makes it a very effective first aid agent. An ice pack made from crushed ice or frozen vegetables should be applied directly to the skin. Frozen gel or chemical ice packs should not be placed directly on the skin as they can cause frostbite. A good “rule of thumb” is to apply ice to an injury for approximately 20 minutes every hour for the first 48-72 hours depending on the severity of the injury. Compression: External pressure on an injury helps to decrease hemorrhage and hematoma (accumulation of blood) formation. An elastic bandage applied around the injured area is an excellent way to reduce the swelling. The wrap should be worn throughout the day and removed at night unless otherwise directed. If the athlete complains of numbness, tingling, or change of skin color, the wrap should be removed. Elevation: Along with ice and compression, elevation reduces bleeding and swelling. By elevating the affected body part above the level of the heart, bleeding is reduced to the injured area thus reducing swelling. Elevation can be achieved by placing a pillow under the affected area while resting. 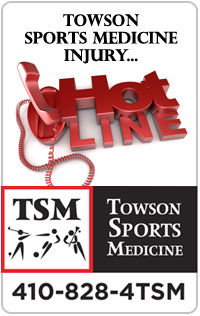 If you have any questions about when or how to use the PRICE acronym or would like advice on when your child should see a physician you can call our 24-hour sports medicine hotline at (410) 428-4876. You can change this if you would like to word it differently or omit it. Q. My son recently suffered a concussion and I am unsure if I should send him back to school right away. Is there a right time to send them back to school after and injury like this? A. Thank you so much for reaching out to us. Concussion management can be very tricky. There is no true cookie cutter response. Each individual reacts differently to this injury. I would start by having your child evaluated by a certified athletic trainer and/or a physician. A general guideline put forth by the American Academy of Pediatrics states that if an individual is experiencing symptoms that affect their ability to concentrate or tolerate stimulation for 30 minutes, that individual should remain at home. When an individual is able to tolerate symptoms for 30-45 minutes, a return to school is warranted. It should be noted that the individual take breaks if needed in a quiet space. The individual should take breaks from class every hour or so initially. Be sure to visit “Tips from the Training Room” for additional parent and patient resources!